Nick and I loved our time at the cabin. We very much appreciated the firewood and gallon of fresh water that was left for us upon arrival. This is our second year coming to Southern Comfort and I hope to make it again next year. I truly love everything about this cabin. As always, the cabin was fantastic. Allstar staff allowed me to book last minute on a holiday and double checked to make sure I had the booking. They even went back to the office. I had a great view and this is the second time that I booked with Allstar where I had deer come onto the property. The price was reasonable for the accommodations. The cabin was easy to find. I have booked with Allstar 5 or 6 times now and will continue to do so. Thank you for a lovely time. Riverside Retreat was very enjoyable and relaxing. We enjoyed our stay very much and we will be back. There was so much to admire and enjoy about the Grand Lodge---the location, the extensive grounds with the carp pond, the building itself with the beautiful outdoor and indoor woodwork furnishing and fittings, including the fireplace of which we took full advantage in December! The kitchen fittings and extensive range of cooking equipment were excellent---we did notice that the larger oven door did not seem to close properly but we cooked a 13 lb Turkey in the expected time. We appreciated the 100% cotton white bed linen and towels and the mattresses were all very comfortable. Bathrooms were more than adequate especially the great master bath shower area! We enjoyed exploring some of the local attractions, Luray Caverns, Covered Bridge, the various Civil War and historical sites, walks around Laura Lake and Bryce Resort etc. Our visit whetted our appetite for a summer visit. Thank you and hope to visit with you in the future. I had a very positive experience. The owners were overwhelmingly nice and the property was wonderful. My only suggestion is that the description state that there are doors on only one of the bedrooms, but that is a minor thing for me. I would definitely recommend this property to others. We had a wonderful stay at Franklin Manor. It was a great cabin in a convenient but quiet location. The accommodations were perfect. We couldnt have been happier. The attention to detail and cleanliness of the house were more than I expected. We enjoyed ourselves so much in fact that we are talking about coming back in the Spring. In my opinion, there isnt any room for improvement. It was really awesome and fantastic.... I would like to recommend my friends. We really enjoyed this home. Great layout that created a quiet atmosphere. Beautiful property with plenty of room for the dogs to run. Awesome views. Plenty of games and fun things to do. Comfortable beds and great water pressure. Love the sharp kitchen knives. So many rentals have dull knives. Great kitchen with plenty of space for cooking. Hi , We loved the cabin and beautiful scenery. The side room was a nice area to read and relax. The fireplace was excellent and use it all the time. We would definitely rent it again. Everyone was helpful, and follow up was great from the Allstar Lodging staff. We had a fabulous three night stay at Spring Farm Retreat. We felt at home and in fact the hominess reminded me of one of the old houses I grew up in in Philadelphia. The gas fireplace was a huge plus and we ended every day with wine and conversation in front of the fire. The sunsets were an added bonus. and we walked the front yard every morning. Access to every thing we needed and wanted to see in the National Park and the Valley was very convenient. Hi. Yes, my daughter and I enjoyed our stay at the Strickler House. We toured Luray Caverns and hiked a trail in the Shenandoah. The property surrounding the Strickler House was gorgeous. It was a great weekend for sisters to get together. Couldve found something way cheaper but we had 2 dogs with us, so made it convenient. The fall leaves were in full affect to make a great scenery around the cabin. Directions and packing suggestions were right on. Amazing deck and situated on the road to keep it secluded enough. Didnt get to use the fire pit but the wood stove made it comfy. Located close to wineries and hiking, which was our mission. Definitely would suggest this place. It exceeded our expectations. The place was clean, cozy, and well stocked, and we definitely plan on going back again! Thank you for such a great experience! Our stay was very pleasant and the home was clean and well-furnished. We greatly appreciate your allowing our well-behaved dogs to accompany us, as they are part of the family. My experience was excellent overall. The house was well-appointed. I liked the indoor and outdoor fireplaces, although it was too windy for us to use the outdoor fireplace. The beds were comfortable. Everything was clean. I thought it was a good value for the price. I would recommend it to friends. Our recent stay at Frenchmans Pond couldnt have been more perfect! As we pulled into the driveway, we were stunned by the natural beauty of this most amazing property. Our initial impression was surreal - we had to take a moment to pause as we came to the realization that we had just died and gone to heaven! We didnt even make it all the way up the driveway to the house - hubby stopped the car promptly once we pulled alongside the larger of the two ponds, pulled out his fishing gear and off he went, while I explored the surroundings and the cabin. We were pleasantly surprised by the layout of the cabin itself - extremely unique. The location, the fabulous beauty of the grounds and sights of the surrounding mountains was exactly what we both needed. I have never seen so many stars in the evening sky as I have as we sat out by the chimnea one evening and gazed up - the sky was totally light up by the stars and there wasnt a blank spot on that perfect canvas! This is the second time we have booked with Allstar and we are looking forward to booking with you again! Thank you for sharing this breathtaking property with us and for making the reservation process so easy. Brenda & Buck PS I caught my very first fish here! My husband and I wanted a quiet, peaceful weekend away to celebrate our birthdays and that is exactly what we received. The cabin exceeded our expectations of a remote mountain cabin in the mountains with the modern conveniences of home such as central air and a dishwasher! Upon arrival we found the cabin absolutely spotless with dry wood already placed next to the door in the screened in porch, fire starters and all! The view from the back porch was fabulous and we enjoyed sitting and listening to the rain by candlelight drinking wine. I was surprised how easily I found its location, I am glad I have a jeep however, they really do mean 4 wheel drive is needed! We are already planning our next trip to the area in the spring and plan to use Allstar Lodging again. Overall, it was a fantastic experience and we look forward to using Allstar Lodging in the very near future. Our stay was great! The property was perfect for our family. The open layout, canoe, fire pit, board games and movies made for a great long weekend in a beautiful setting. 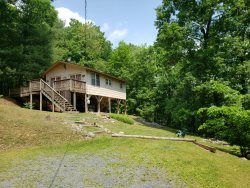 Weve rented many cabins in the mid-Atlantic and I was very happy with the cleanliness and overall condition of Riverside Retreat. Keep up the good work. The home was lovely and the process was very easy. The land surrounding the home was huge and fun for my kids and dog. Our time at the cabin was great. From the moment we stepped in to the fully furnished rooms to the smell and decoration of autumn we were in awe. Each room was decorated and felt like a rustic getaway cabin. All of the facilities worked great, even a fully stocked kitchen so we could cook our meals and not worry about bringing equipment from home. But other than the noise issue, our time there was much needed for our honeymoon vacation. It was the perfect middle spot to see the Luray caverns and the National Park. Thank you so much for the wonderful cabin and all that went into making it so very clean and home like to stay in. Everything was wonderful. We absolutely loved the cabin and the view. A slice of heaven on earth. We would love to visit again. Everything was Perfect. Thank you so much! Thank you very much for a great accommodation. My sons and I enjoyed the beauty and peace of the cabin. It was special time with the kids. The bird feeder on the other hand was great. Hundred of birds coming and ate most of the birdseed. Enjoyed sitting on the porch and watching. Again, thanks for a memorable weekend with my children.